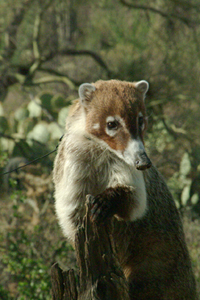 Hi Kids, Carl Coati here again with a BRAND NEW ADVENTURE! I have just returned from an exciting trip to the deserts of Central Australia. Look at the map below to see how far Australia is from my home in the Sonoran Desert. The Sonoran Desert is in North America, yellow on this map. Australia is the country that is orange on the map. It took me almost one entire day to fly there in an airplane! I thought it would be fun to compare the plants, animals, and people of the Sonoran Desert with those of the Central Australian Deserts. Do you think they will be the same or different? Click on one of the links below. Run your mouse over the picture to see who is home. When your cursor changes from an arrow to a "hand" click and you can discover cool facts about plants, animals and people.